“The niche is all yours,” the tall, lanky guy says, referring to this cluster of soft chairs he’s getting up from. It’s true that I like to have room enough to spread out, but not so much as to intrude on others’ space. Not so much the case for the previous coffee shop patrons. There’s a candy wrapper on one table. This coffee shop doesn’t even sell candy. There’s a coat on another chair as a placeholder, a reserved sign made of fabric. “That’s trusting,” I say to the guy, pointing to a woman’s purse hanging on the back of an empty chair. “Anyone could walk off with that,” he says. Ann Arbor is a walking town. Most stores are close enough to each other that walking from your apartment to a restaurant and then the small, specialty grocery store before returning home is easier than driving. A bus passes outside on State Street. Even in the rain, public transportation is the better option. “Yeah, or hop on a bus,” I say. Growing up in the city limits of Pittsburgh, PA, public transportation was plentiful, much like Ann Arbor and its surrounding neighborhoods. Pittsburgh is a bigger city, of course, much bigger, and we used it all the time after our family car died. I remember Dad coming home after work with an armful of bus schedules. He plopped himself on the floor in the middle of the living room, spread out the maps and began to figure out how the heck you traveled to downtown from our house. Fortunately, we lived on a bus route. It was a good bus route, one of the main ones, not far from a depot garage. Buses had a frequent schedule in my neighborhood, even on Sundays. A light rail system was constructed when I started high school. That was my first exposure to “subways,” a misnomer I always thought because the T ran underground for only three stops. It was an above-ground transportation outside downtown proper. “My friend’s dad could read the entire New York Times in a tight space on the subway,” he says. I’m impressed. I could never stand and read on a bus. My survival skills in tight spaces came from sitting down. Maybe this is why I can be self-contained sitting down in a coffee shop. Riders learn to multitask early. You eat a sandwich in your seat without spilling any on the passenger next to you; the tantalizing smell throughout the bus was out of your control. You sleep with your head against the window and intuitive feel when it’s time to wake up to get off at your stop. You learn how to place paper grocery store bags on the floor so that passengers won’t step on or trip over them. I did develop strong legs and a sense of balance to stand upright and not tip over as the bus bounced and jerked and turned corners. You learned to politely shove your way through a smash of people to exit at your stop. You talked with the people you saw every day, creatures of habit you all were, work and school schedules always the same. You gave up your seat for people with packages, women with children, and the gentle older folks. This guy must be a rider of sorts because he continues to discuss public systems. He says the John P. Getty Museum in Los Angeles is located at the top of a mountain. The area has a great system in its three-car train that goes up the mountain. The ride is smooth and the flow of traffic is easy. I took the bus for many years to college and then to my job in downtown Detroit. I remember passing the time writing stories in my head. Wish I wrote more of them down at the time. I find inspiring thoughts about character and plot creeping in as I read your post. Would a protagonist give up his seat on a crowded bus or subway for an older adult or a tired mom? Might two strangers establish friendship through a series of chance encounters? 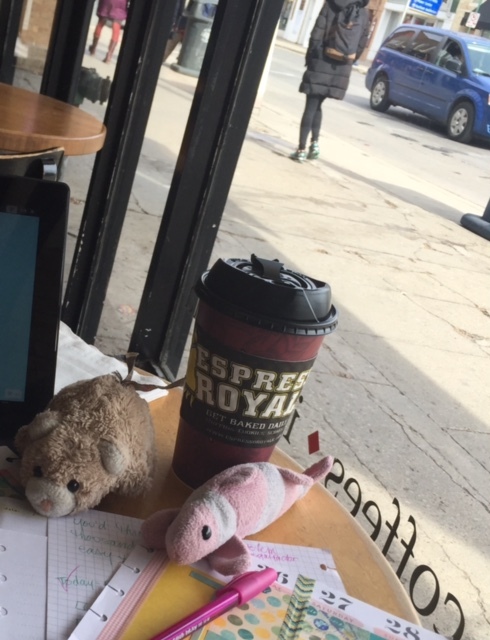 What motivates a student to seek a public place like a coffee shop, instead of a library, in which to study? Great minds think…. That #2 scenario happened with Dad and a busmate. Of course, Dad made friends with everyone…. The idea of a student studying: did something happen to the protagonist in the library that makes him/her avoid the library entirely? Oh, the ideas are swirling!